This is my second post about The Old Ghost Road, which includes some ride and transport details. The first post, which is about preparing and packing for the ride, is here. The Old Ghost Road is an 85 km single track mountain bike trail and walking path in the upper South Island of New Zealand. It begins at Lyell - near the town of Murchison - and it ends on the West Coast, near the small settlement of Seddonville. The Old Ghost Road traverses mountains, deep river gorges, dense forest and rough backcountry. It is remote, exposed, with rocky sections above the treeline. On a clear day, there are incredible views in every direction. The steep, jagged rocks and golden tussocky peaks are spectacular. Living in Wellington, I had to take my bike on a plane across the Cook Straight to Nelson. Air New Zealand allow a bike on the plane if it is packed correctly. This means putting it in a bicycle box and ensuring it doesn’t weigh over 23kg. At Wellington airport, I purchased a specially created Air New Zealand box ($25), which I went and picked up in advance of my flight. It takes time to pack up a bike, including removing pedals, straightening out handlebars and taking off the wheels. You can’t just roll up at the airport and get it all done with only a few minutes to spare. When I landed in Nelson, I had the dilemma of what to do with the bike box - which I hoped to use on return. In the end, I couldn’t find anyone at the airport who would take it, so I left it to be recycled. After assembling the bike (they have a useful bike-tool point) I hit the road to my hotel in town. Unfortunately, getting rid of the box proved a mistake. At the end of my trip, when I returned to the airport, Air NZ in Nelson didn’t have any of the boxes for sale. They wouldn’t let me on the flight. Having gotten up at 5 am for the redeye, I had to rebook on a later afternoon flight, find a nearby bike shop and purchase a box from them. It was a hassle and cost me some money ($60?) to change the flight. So, if you plan to fly with a bike, make sure the airport has the bike boxes before you go there. For transport to the trail, I booked with Trek Express to go from Nelson to the trailhead at Lyell. However, due to a mixup with the booking, I had to change to the Intercity bus. It was half the price at $30 (rather than the $60 Trek Express charges), so it ended up working out well. From the trail finish, I took the return shuttle with them from Seddonville to Nelson ($100). After an obligatory photo under The Old Ghost road starting archway, a bridge to the trail crosses a small stream. It is the start of a long climb. The path winds its way up the valley, through mossy and lush forests. At any stopping point, silent and friendly Robin’s fly in, hoping you might uncover some food. Periodically small streams, creeks and waterfalls flow across the pathway. About half-way to Lyell is the abandoned town and collapsed hut of Eight-Mile, a good place for a break. A kilometre or two further on are the big slips of 1929. Riders need to dismount and walk. 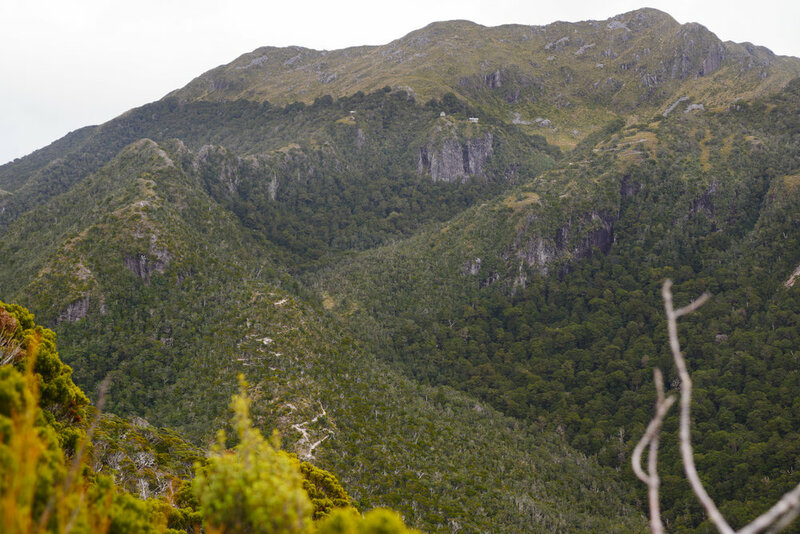 After this, the trail levels out before the turnoff to Lyell Hut. Overall, the first day is an uphill slog. But the clear skies, clean air and silent forests more than mitigate any exhaustion. It isn’t so bad. Lyell Hut sleeps 12 people, has two rooms and excellent views over the valley. It faces the sun, which sets behind the mountains. For another 6-7 km, the trail keeps ascending through the bush, getting steeper and rougher in places. For anyone doing the full climb in a single day, the last few km’s are tough. At the top, the trail breaks out above the treeline. It follows a couple of open ridges and then reaches the most precipitous part. Winding along a narrow ledge, a steep drop below, the path eventually reaches the highest point, Heaven’s Gate. From here it is a short distance onward to Ghost Lake Hut, which is the nicest, best-situated hut on the trail. Unfortunately, it is also the most booked up hut, so it isn’t easy to stay here. For most of this day, you are surrounded by hills and mountains. There are incredible views in all directions. Ghost Lake Hut in the distance, the zig zag descent in front. Photo taken from the Skyline ridge. From Ghost Lake Hut a sign warns the next 3km are difficult. First, it’s a steep zig-zag descent over a rough trail with big drops on the sharp corners. Next is an ascent, which I found more comfortable to walk than ride. Finally, there is the spectacular skyline ridge, with magnificent mountain vistas in all directions. A rider called Andy, who I had met that morning, crashed and broke his nose up on this ridge. I guess he was enjoying the views, not looking where he was going. Next thing, he’d gone over the handlebars. The challenging 3kms ends after the skyline steps. From the steps, it’s a long flowing cruise downhill to Stern Valley Hut, which is situated by the river. The morning’s ride begins with a climb, surprisingly, up what looks like a half-collapsed mountain. Years ago, a whole wall of rock collapsed, I assume in the big earthquake. 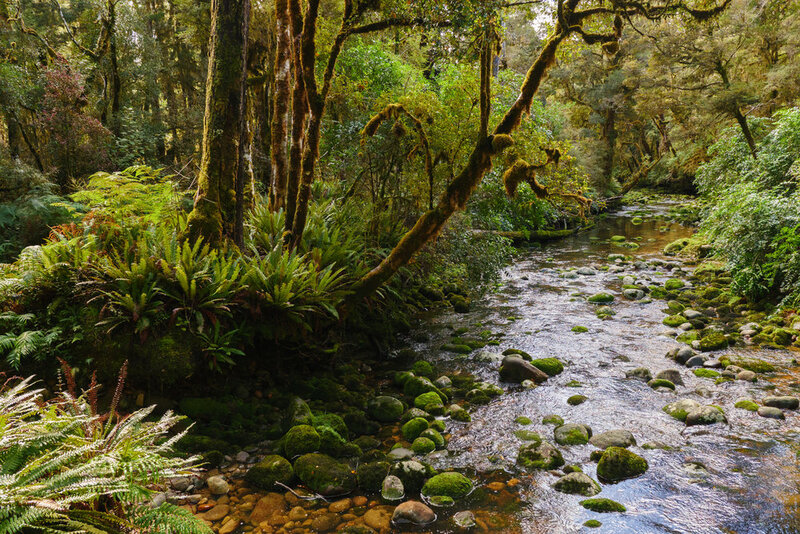 Next, there is another enjoyable forest decent to Goat Creek Hut and the Mokihinui River. Here the trail follows the river to either Mokihinui Forks Hut the Specimen Point Hut. The latter is the nicer, but the former is less used. I stayed in Mokihinui hut, and there were only four of us. Someone I spoke to who stayed at Specimen Point described the facilities as pushed to their limit - it was full and rowdy. Mokihinui has an older style long-drop toilet but otherwise was rustic but comfortable. I was expecting this last half day to be an easy cruise alongside the river flats. As it turned out, the ride was rugged and along the edge of a narrow gorge. The trail was cut into the cliff, often high above the river, steep drops below. It was spectacular, but an unexpected challenge. After a couple of hours, the trail ends unglamorously at a carpark. Here I celebrated by washing my bike at the Rough and Tumble Bush Lodge, which conveniently had a hose outside. The lodge looked like a pleasant place to recover from the journey with an expensive beer or lunch. But I decided to push on and ride the last couple of km’s to the Seddonvile pub. I didn’t want to miss my shuttle back to Nelson. In Seddonville, I anticipated finding a lively historic country inn, filled with locals and mountain bikers relaxing on a Sunday afternoon. Instead, I found an 80’s sports bar, which appeared to be empty (it wasn’t empty, the sole other customer was broken-nosed Andy, who I had met earlier). While the fish and chips I had for lunch were a bit average, they also offered a shower. It was possibly the best scrub I ever had in my life. So, all in all, the Old Ghost Road is an incredible journey. Tough, but rewarding. It’s also three days of beautiful, dramatic and remote countryside. As I always do on trips like this, I found myself wondering why I don’t do them more often. Also worth noting is the incredible hard work and commitment it must have taken first to build the trail, and then secondly, to maintain it. This was all made possible by a very dedicated group of volunteers and The Mokihinui Lyell Backcountry Trust. Thanks to them this fantastic ride is something we can all enjoy. Read more about planning for the ride.